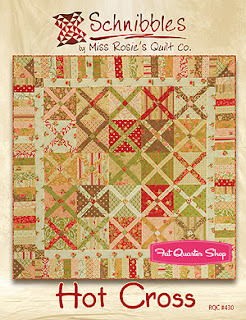 Pattern: “Hot Cross” in Schnibbles Times Two, by Carrie Nelson, of Miss Rosie’s Quilt Co.
Quality of Pattern: As mentioned with the “X-Rated” and “Plan-C” reviews, I’m a big fan of Carrie Nelson’s patterns. They’re straightforward and concise – no extra fluff, which is nice. It’s inspired me to go back and re-work a couple of my own patterns. Difficulty Level & Technique: I feel that I can classify most of the patterns I write and the other designers’ patterns I try somewhere in the range of “Confident Beginner to Early Intermediate.” I feel like this baby is more firmly in the Intermediate range. Perhaps I was a little cocky in thinking this was a super easy pattern that was going to go together really quickly – and don’t get me wrong … the blocks just fly together. The re-sizing and assembly, however, were a bit tricky. I figured that based on the instructions, I could just measure 3.5” from the center of the block to the edge, trim, and I would be ready to put the squares together. Um … nay nay. Now, perhaps this is because maybe I wasn’t as careful or meticulous while I was putting the blocks together, or I wasn’t super-careful while I trimmed the first two blocks, but my corner-stripes were nowhere near the centered right angles they were supposed be. I had to scrap those first two. For the remaining blocks, I used my water-soluble marker to draw lines down the center of each X, and then used those lines, plus my measurement from the center to correctly square the block. I was much happier with the results. Adaptability: Because I was using fat quarters, rather than layer-cake squares I opted to start with 9” squares to make better use of my stash, rather than the 10” squares the pattern called for. I left all the other measurements the same and just trimmed off the extra fabric. As with my “Plan C” quilt, I also opted to skip the piano-key border. I wanted this quilt to be more of a lap-sized quilt, so I kept the cream middle border, and added just a top and bottom famed checkerboard border so that it was more rectangular. Speed: This blocks in this quilt go together really quickly, but accurately trimming the squares takes some time, especially if you use my method of marking the centers of the “X” before cutting. Still, without Carrie’s border, my quilt top went together in about a week. Would I make this pattern again? : Despite the problems I had with trimming my first couple of squares, I definitely think I’ll be revisiting this quilt soon. I’m planning a red-white-and-black quilt as a Christmas gift that might be super cute with this pattern, and I have an idea inspired by this pattern for more of a latticed type quilt floating around in my head as well … so we’ll see! Please visit our new Etsy shop! from Sacramento, CA! I'm wife to a handsome guy, mom to two more handsome guys and two squirrely puppies, quilter, pattern writer, ... and I'm addicted to fabric! This is my place to share my love of all sorts of crafty projects. Thanks for stopping by!! Which Book is on my Nightstand? I flew through A Discovery of Witches and LOVED it. So far, I'm enjoying the second book as well. I think it's going to be a long, long wait until #3 comes out!